Malu (Maria Luisa) gets some bad news - she will have to move from Florida to Chicago for the next two years. Her Dad and Mom are divorced, but they still get along. Malu will miss her Dad, who owns a record store, embraces punk, and "gets" Malu in a way her Mom just doesn't. At first, everything about Chicago seems terrible. Her mother is trying to convince her to get in touch with her Mexican roots, and a mean girl at school makes fun of her Spanish. 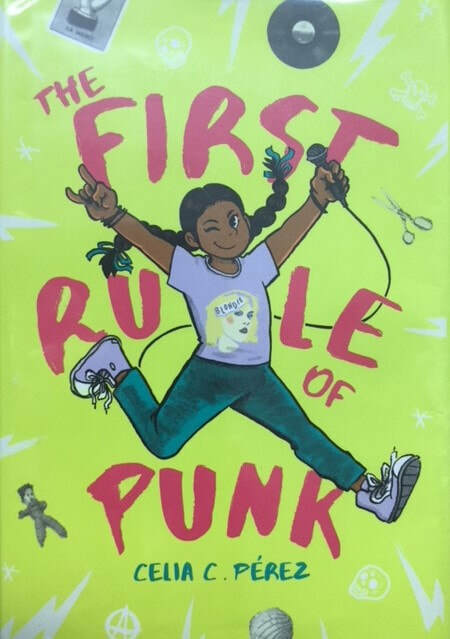 As Malu gets to know a few people and starts to get involved in projects, she starts re-thinking what it means to be Mexican-American, a daughter, a friend, and even punk. There are a lot of things about this book that are memorable and immediately appealing. Malu likes to create 'zines - mini magazines about a specific topic using cut-out images and drawings, and these are scattered throughout the story. She also likes punk music and fashion, and is introduced to more Mexican-American music, including punk artists, through the story. This is a character I've never met before, and that's a good thing. it's actually sort of cool that she insists on wearing punk make-up to school and immediately gets sent to the office for being in violation of the dress code, and while she doesn't want to be disrespectful or disruptive, it does raise the question about what kinds of social limits are too strict or overly conformist. The book's focus stays more on Malu's personal interactions and identity, rather than digging deeper into societal expectations, but it could still be a good discussion topic related to this book. Malu's attitude about the move and toward her mom is really unpleasant. It makes sense for her to be a rebel, and the point is that her mother is trying to guide her one way and she wants to go another, but I actually think her mother is unrealistically patient, given some of Malu's attitude. I'm also not sure the school rebellion is entirely necessary - she doesn't even take her concerns to the principal before she plans her resistance event and (although I don't want to spoil anything here) not getting your way isn't the best reason for a protest. Malu's understanding about the protest and why she needs the event evolves into something more positive over time. I found Malu's searching aspects really compelling - she looks for ways to be different from the norm and that's what makes her most comfortable - her need to express herself through music and fashion and her zines strikes me as very authentic. I like the infusion of different generational voices in Malu's world, too - Mrs. Hidalgo at the neighborhood coffee shop is a fellow anarchist, while her mother, Malu's neighbor, is more traditional, yet both of them bring details about Mexican food, culture, and the Spanish language to Malu. Finally, it's nice to see a book where the character's divorced parents get along, but they still address their different personal and cultural styles as a real part of the way they interact with their daughter. "Excuse me, but did I just hear you quit, punk rock girl?"